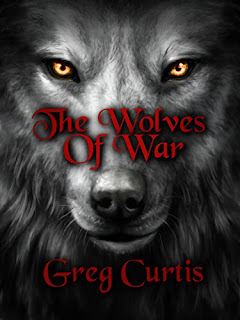 The Wolves of War by Greg Curtis. Briagh has a secret. He's a morph. One born with the gift of changing shape. He has another secret too. He's also a thief. A genuine cat burglar. Meanwhile Elan has her own secret. Despite pretending to be a bardic warrior she's actually the Princess of Abylon. And she too has a second secret. Her entire family is mad. Her father and brothers are unfit to rule. Her mother is not dead as people believe. Instead she's become the psychotic wolf mother, whose pack has been killing and devouring the people of the city for a decade. And then there's the Court and their little secret. They rule the Kingdom of Abylon even though they do not have the right. Secrets are useful things. They allow people like Elan and Briagh to live normal, even comfortable lives. They allow a kingdom to be governed by those who do not have the authority. They make life for the people of Abylon possible. But when their secrets are revealed, none of those things may hold. And when the wolf mother is the reason for that revelation – it may be war. For those of you who who follow my blog will probably know that I am a huge fan of Greg Curtis. If you didn't, then you do now. I've read most of his books, and I enjoy the formular he uses in his stories - the quite, reclusive main character, shunned by society, who has talents that requires him to become a hero to his people. I guess I'm a sucker for those types of storylines. Moving on to this book, the main character is Briagh who is a Morph, born with the ability to change shapes. He is also a thief that has a tendency to run when the going gets tough. The other main character is Elan, Princess of Abylon. She is a fierce, strong willed woman who wants to kill all Morphs due to the tragedy that befell her family. The storyline follows both Briagh and Elan who become involved when a crazed woman leading a pack of wolves begins to attack the city of Absynth. I guess I had high expectations before reading this and I certainly wouldn't say I was let down but I have to admit it's not one of Curtis's best works. The storyline for me felt a little bit fanciful and did not flow as well as his other books. I did however like the main character Briagh, he had a bit more backbone than what you usually get and was enjoyable to read. As for Elan, she had a remarkable personality (basically a psychopath) and one I won't be forgetting in a long while. It was nice to get that contrast between Briagh and Elan. If you're fan of Greg Curtis then you know what you're getting into, and this book naturally follows his previous novels, and whilst not his best, you still get that satisfying feel. If you haven't read his books before then I would suggest trying his other novels first like 'The Godlost Land', 'Banshee Hunt' or 'The Lady's Man'.